We've been on a bit of a barrelling kick here in Vineland. We've done a couple of stories on bourbon-barrel aged wine -- and I've seen more and more beers marketed as "aged in barrels," usually whiskey or wine. A natural outgrowth, I expect, of the worldwide bourbon boom. After all, bourbon barrels can only be used once for whiskey, and all these old barrels gotta go somewhere. I'm certainly all for waste not-want not. Inevitable, then, that this desire for upcycling old spirit storage would start to land in other reaches of the world of potent potables. I got to try a rather unique concoction recently -- one that still puzzles me a bit. Gentle readers -- meet D. George Benham's Barrel Finished Gin. I know -- that last word done threw you for a loop, didn't it? Gin -- that most aromatic of hard liquors, greeted immediately with a partisan facial expression, depending on the drinker's perspective. In all my travels, gin is the most divisive spirit, in my estimation. Personally, I'm in the "pro" category, but I'm usually a traditionalist when it comes to these -- Martinis, Negronis, summertime gin & tonics...you know the drill. But the Benham's is a different animal altogether. From Graton Distillery in Sonoma, CA -- Benham's is made in the traditional gin fashion. If you're unfamiliar, gin starts out as most liquors do -- as a neutral, usually grain based spirit. Once there's a base spirit -- basically pure ethanol -- it is redistilled with a bunch of aromatics, usually based around juniper. Benham's includes other botanicals like buddha's hand, grains of paradise, galangal, meyer lemon, and others. Benham has produced a relatively small-batch gin for some time, but this year -- they're rolling out their barrel-aged version. This version of the gin is aged for a period of time in used Zinfandel barrels, a varietal they landed on after trying several other varietal barrels. “We experimented a lot. We used Pinot, Syrah, and even Chardonnay barrels. The Zinfandel barrels have the right spiciness that plays well with our local Northern California botanicals such as lemon,” explained Jeff Duckhorn, the master distiller of the product. Now, aging gins on wood isn't exactly a new thing. The precursor to gin is a Dutch spirit called genever. There are two versions -- neue genever, which is clear and oude genever, which is aged on wood and -- I was informed -- is only consumed by older folk. When I first tried -- and enjoyed! -- it in Amsterdam at age 41, I was informed that I was now the "youngest Oude Genever fan in the Netherlands." I sat down one evening with the Sweet Partner in Crime and some nosing glasses to give this a run. Our first reaction was universally positive. If you're a gin fan, you'll love the aromatics on this spirit. There's the juniper, lemon, and spice aromas that you'd expect, but with an undertone of freshly cut wood and some neat vanilla scents and flavors. We had it on a couple of rocks first and liked it -- but neither of us tends to take our gin straight like that. I started cocktailing. I tried to make a martini with it, but the flavors weren't right. The crispness was somewhat lost. A gin and tonic was better -- but not mindblowing. I did a little research on aged gins -- there are a few others out there -- and some bartenders have subbed this gin into other cocktails in place of bourbon. I made a Manhattan with it -- and it was certainly an interesting cocktail which I dubbed the Fort Lee, since it's Manhattan-adjacent. Found it to be good, but next to my normal recipe that I make with Bulleit Rye, it didn't measure up. I also tried it in a Negroni, and I didn't think the botanicals played well with the Campari. It ended up *really* bitter, which might be a positive for some drinkers. Here's the thing. I like the gin. I would recommend this gin. I just don't know what I would do with the gin on a regular basis. Perhaps this would appeal more to someone who's more of a gin-on-the-rocks person than I am. Because it really is lovely to sip. If you have a gin aficianado in your circle and you can find a bottle of this, they'll probably appreciate it. 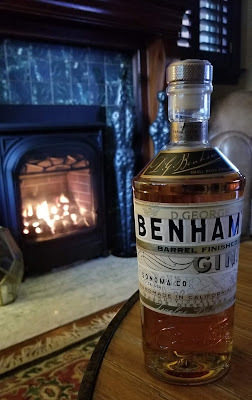 Benham's Barrel-Finished Gin retails for $42.99 for a fifth.